The recovery continues. As you may know from previous posts, I made a radical change in my lifestyle a few months ago, and am no longer eating the Standard American Diet. After following Dr. Joel Fuhrman’s Eat to Live program for five months, today I am just a whisper away from having lost a total of 40 pounds so far. I have a big goal: 30 more pounds, for a total weight loss of 70 pounds, target date May 1. I will make it at 2 pounds each week. This is a very exciting project for me, and I feel healthier each day. Perhaps this improvement in my overall health throws other things into more stark contrast. I have a lot of leftover inertia from the dark days in November, when I was weepy, irritable, and could hardly move. Perhaps I need to adjust my expectations. I am judging myself for appearing over-dramatic, while I also realize that I am minimizing something that was potentially quite serious. I have added the practice of writing down my accomplishments for each day, even if I just write, “Took a shower. Bought groceries. Saw three clients. Taught class.” When I acknowledge my accomplishments, I have proof that I am improving, taking constructive actions each day. This is an important element in recovery from a burnout, I think. The good news is, I have been writing every day. That part of my creativity practice is going well. However, I pressure myself ibecause I have not published anything on either of my blogs in several of weeks. In other words: still not the productivity that I would like to see for myself. There are a lot of “should do’s” in my to-do plans. They are tasks and projects that are important, but not urgent. One factor contributing to my burnout was that everything that needed to be done seemed to be on urgent status. It is impossible to prioritize tasks when they are all the same level of importance. My to-do list gets longer and longer. I realized that the feelings of overwhelm, or just plain whelm, are still very close to the surface. With the surge of energy that arrived in late November and December, I generated a lot of ideas for new projects, and also for implementing some systems to help my work flow more smoothly and to keep my new priorities straight. However, there are so many ideas, and so much that actually needs to be done, that the to-do list is daunting. I have felt some of the old paralysis, resistance to getting on with it. I am able to access a memory from somewhere that “there are no ‘shoulds’.” Maybe yes, maybe no. However, I know that there is a lot of baggage and resistance that comes up with “I should. . .” or “I need to. . .” I will shift my vocabulary to say, “I want to. . .” “I get to. . .” and “I have an opportunity to. . .” Instantly, the energy shifts. I feel freedom and aliveness to choose those actions that best take me where I want to go. I am learning how to just let go of the rest. Realistically, I actually am accomplishing something small every day. Small is good. Baby steps. I must sit with my own impatience, which is probably a big factor that got me here (burned out) in the first place. So yesterday, I started thinking about how else I could work with this resistance instead of against it. This is a martial arts concept, and also an interesting element within the Feldenkrais Method. Here is my solution, and it is very practical and low-tech. I hope it helps you, too, or perhaps inspires you to come up with something else that works for you. Ladies and Gentlemen, I present: the humble index card. My stack of index cards is a no-list list. A list that doesn’t look like a list. 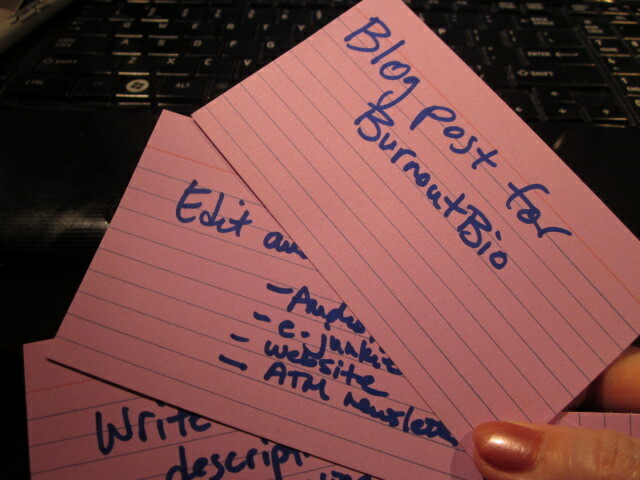 On each card is written a project, task, or deadline. I have put long-range deadlines on my calendar already, so these cards are for work that must be done this week. In the morning, I simply pick a card and work on it. I can make notes on the card about supplies, contacts, or other resources needed, and if there are additional tasks associated with the main project, I can make another card. When I complete the task on the card, I remove it from the stack. That way, I can see one stack getting smaller, and one stack getting larger. The completed tasks can go into an envelope, and I can see at the end of the week that I really have accomplished something! I really need this tangible and visible sensory experience to keep the feelings of overwhelm at bay. See that top card on the stack? It now goes in the “DONE” pile! Woo hoo! I think I am gonna make it.